Red Dead Redemption 2 takes a lot of risks for taking a more realistic approach that doesn't always work but the phenomenal story and the outstanding open world makes this a western no one should miss. 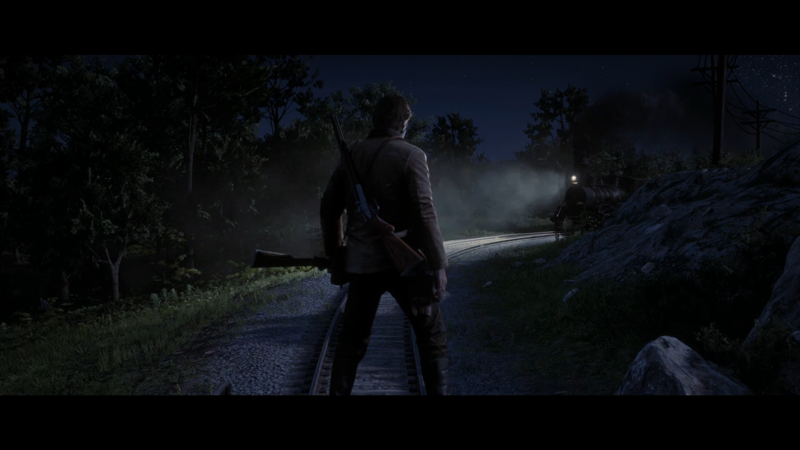 Red Dead Redemption 2 takes place before the events of the previous game, with players taking control of Arthur Morgan; a loyal member of the Dutch van der Linde gang. The story follows the slow descent of the gang as they attempt to escape the U.S. Government, Pinkerton Agents, and rival gangs that are actively hunting them after a job at Blackwater goes south. This entire adventure centers on survival, as the gang tries to find a way to escape the life of the outlaw for green pastures. Unfortunately, that path requires a lot of money. 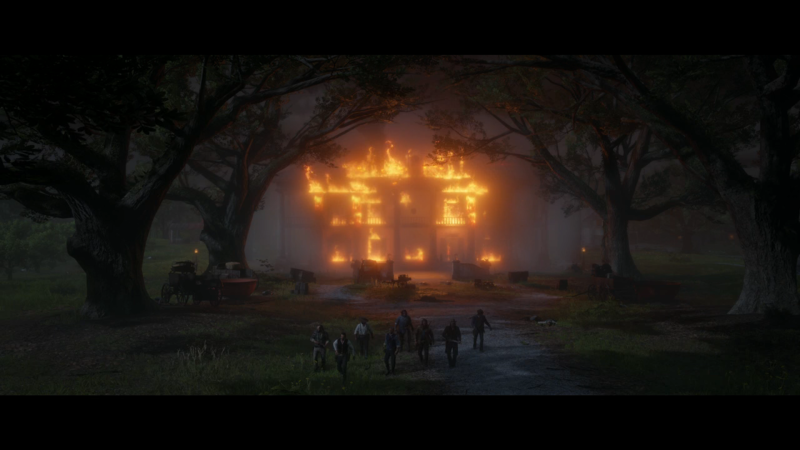 Each one of Dutch's gang is layered, with their own backstory and reason for joining the gang. As you progress new missions provide more insight into everyone. Each character is wonderfully voiced and adds the flair to this incredible story. Arthur Morgan is an outstanding protagonist that is constantly tested throughout the game. 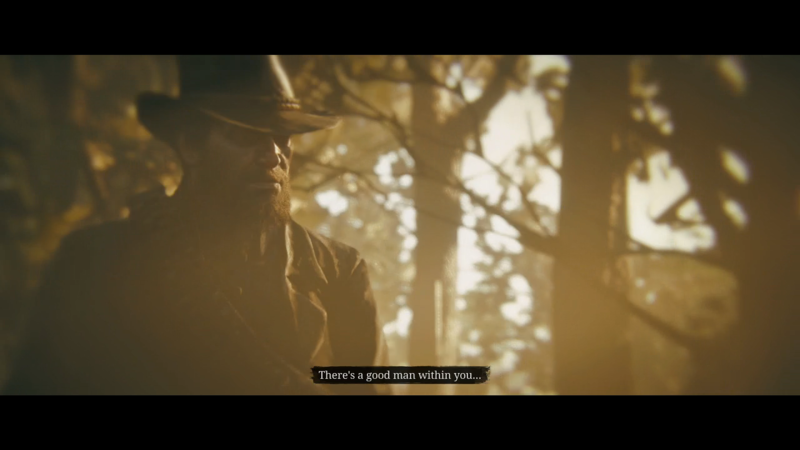 It's made incredibly clear that he's just trying to survive but Rockstar gives the player enough choice to slightly alter Arthur without sacrificing his core values. However, what Red Dead Redemption 2 truly excels at is the open world. Without a doubt, Red Dead Redemption 2's open world is one of the biggest technical marvels in video games. Not only does it have an overwhelming amount of activities and visually impressive but it's one of the most believable open worlds. NPCs not only go about their day but will actively respond to the player's actions. You can kill someone and their family hunts you down, save a man and have them unexpectedly reward you with a new gun, or any multitude of things. Usually, open worlds tend to break after you experienced much of the dynamic activities but Red Dead Redemption 2 has so many of them, some that are one-off actions and others that lead to a series of events, that the open world genuinely feels alive. Much of the game is dedicated to showing what is possible in this large world. Bounties to hunt, places to rob, missions to undertake, and so many activities are available to the player. The game explains the basics but expects the player to discover much of the more advanced options available such as selling valuable items and fast traveling. Missions are varied and offer a range of activities, some shocking and others tedious. In one mission you can be part of a large shootout and in another hunting down another bounty. Many of the activities are meant to serve a purpose but most repeat the same process of having to ride from location to location hoping that the dialogue doesn't get cut off too early. Matching the right soundtrack and sound to each moment is a difficult task but Rockstar has accomplished this with flying colors. Rarely there was a moment that didn't have a soundtrack that benefited the moment. Equally impressive was the sound design, with everything from walking on specific surfaces to the sound of each gun captured to perfection. Red Dead Redemption 2 adds a lot of realistic elements to the gameplay, a first for Rockstar. As part of the Dutch van der Linde gang, you're charged with providing assistance with food, medicine, and money while building upgrades for the camp. At first, this seems like a great way to showcase the growth and the unity of the gang. However, it becomes apparent very quickly that you're the only one providing these supplies making you wonder what everyone else is doing. You have to actively eat, rest, and groom yourself to keep yourself healthy. There's no leveling and everything from stamina to health is determined whether you're fit, overweight, or underweight. You can improve your Cores by running and using a variety of weapons but most of your character's statistics are determined by how well you are taken care of. This allows the player to travel throughout the open world without much issue, the biggest obstacles usually being story related, and determine the diffculty mostly on the player's skill rather than high-powered items or skills. This is also true of your horse. 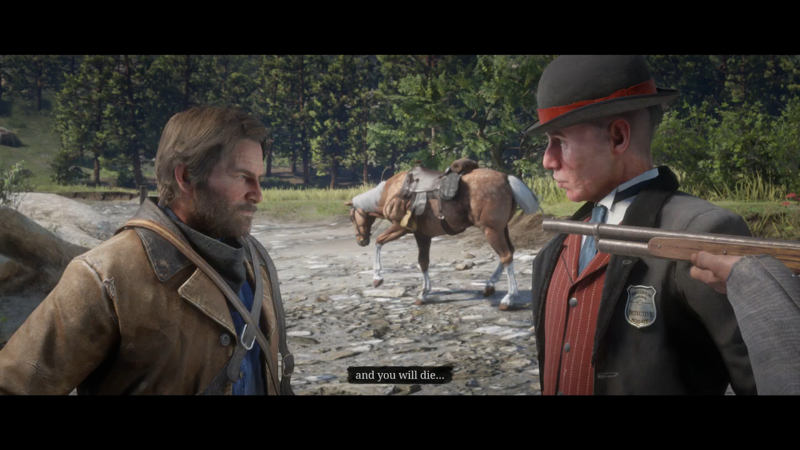 Unlike the first game, if your horse dies, it's gone for good. To make sure this system complements the gameplay players must bond with their horse by riding, feeding, and brushing their hair to maintain their health and create a strong relationship to unlock special bonuses. At first, it can feel annoying but eventually, it becomes second nature. What is irritating is that you cannot call your horse from any location, and must be within range for it to hear you or you'll be stranded. Rockstar has removed a lot of conveniences to complement the realistic gameplay mechanics. Everything from looting corpses or skinning animals have animations that cannot be skipped or turned off. Fast traveling has also been greatly limited from the first game, only allowing it from certain areas. This will lead to the player having to travel massive distances. You have a limited amount of skins you can carry, especially from larger animals, you cannot run while in camps, and other small annoyances begin to mount up as you progress through the game. With the incredible open world and outstanding story and characters of Red Dead Redemption 2, you would assume that any issues would be easily overshadowed, but that's where you are wrong. The controls are absolutely frustrating, lacking the precision and response you would expect from a title this technically advanced. It's common for the player to experience the avatar move erratically and often get stuck in the geometry. What complements the difficult controls is the shooting. Too often the targeting reticle sways around unless you stand completely still and shooting is inconsistent. You press the trigger once to fire and sometimes have to press it again to pull the trigger to shoot again. Dead Eye is available for precise shots and can turn the tide of battle, but Rockstar has balanced this by limiting the meter. 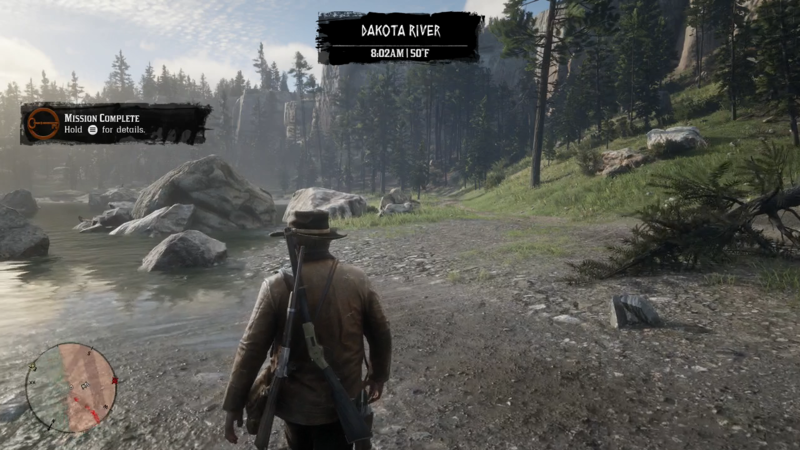 What is a constant vexation is that the game constantly puts your weapons away, even when you're in an active shootout and often unequips weapons when you mount your horse. Since you cannot carry every weapon, complementing the realistic approach, players have to choose 2 primary and 2 secondary weapons. The issue with this being that you can unknowingly have your weapons unequip when mounting your horse, leaving you with a lackluster arsenal unless you check every time. Weapon maintenance and upgrades are essential to keep your firearms ready and polished. Like the Cores mechanics, this is essential since a poorly conditioned weapon is no better than a dull knife. Unlike the fast traveling and aiming this does benefit the realistic approach without being annoying. The first-person view is perhaps the most impressive feature in Red Dead Redemption 2. For most of the game, the exception being specific cutscenes and quick-time events, you can get right into the action and it's amazing. You can see how much detail went into everything from the decorated walls inside a home to the exploding heads when you shoot an enemy's head. It's such a well-crafted feature that playing through in this mode makes the entire experience feel distinct. Red Dead Redemption 2 is one of the most technically impressive games this generation and a story that shares that same quality. The controls and vexing shooting system, unfortunately, holds back the game since it's a constant issue and continuously comes up. Despite this Red Dead Redemption 2 is an outstanding western that rarely disappoints and excels in storytelling.